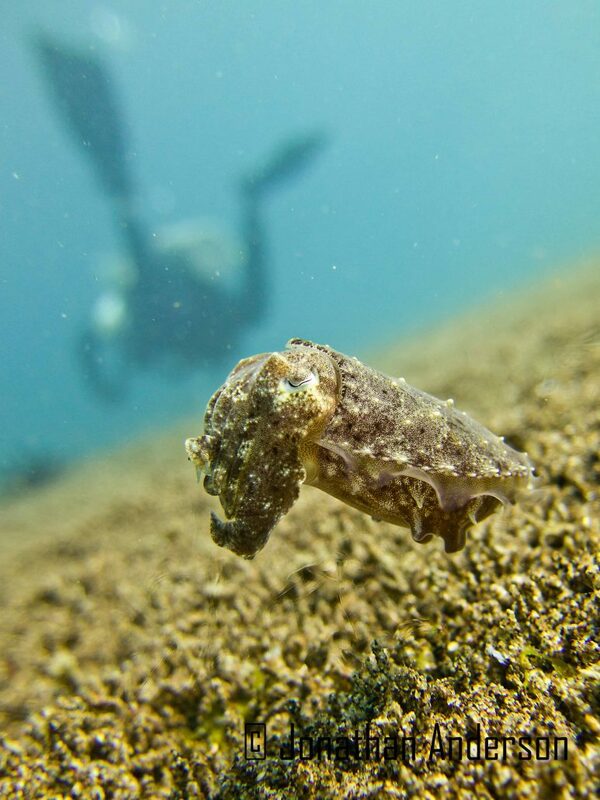 Cuttlefish are very clever creatures. Controlling 8 arms, 2 tentacles and 3 hearts takes one of the largest brain-to-body size ratios of all invertebrates. They can they change their colours and texture in a flash, to match the seabed they are passing over. This makes them awkward critters to spot, but once you have, you won’t be able to take your eyes off them. 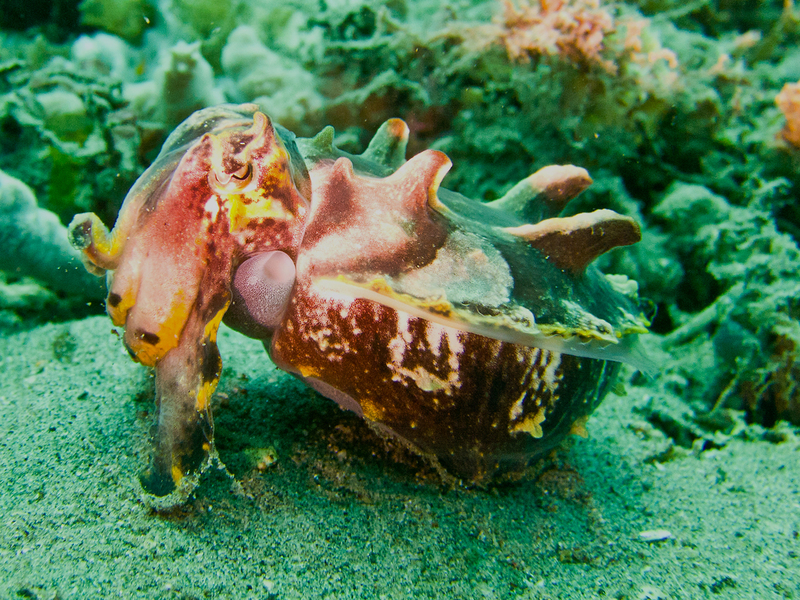 The Broadclub Cuttlefish is Dauin’s most common Cuttlefish, but is anything but common in the way it is able to rapidly change colour and texture. The Broadclub is covered with thousands of pigment-filled sacs called Chromatophores, containing three different colours. 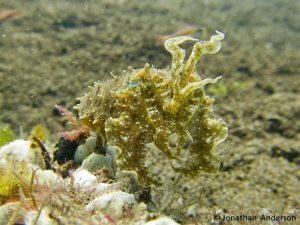 These sacs are surrounded by hundreds of tiny muscles which expose or hide the colours almost instantaneously, creating rapid patterns and designs. Scientists believe this allows cuttlefish to communicate with eachother, warn off potential predators, and perfectly match their surroundings to creep up on dinner, or avoid being dinner themselves. 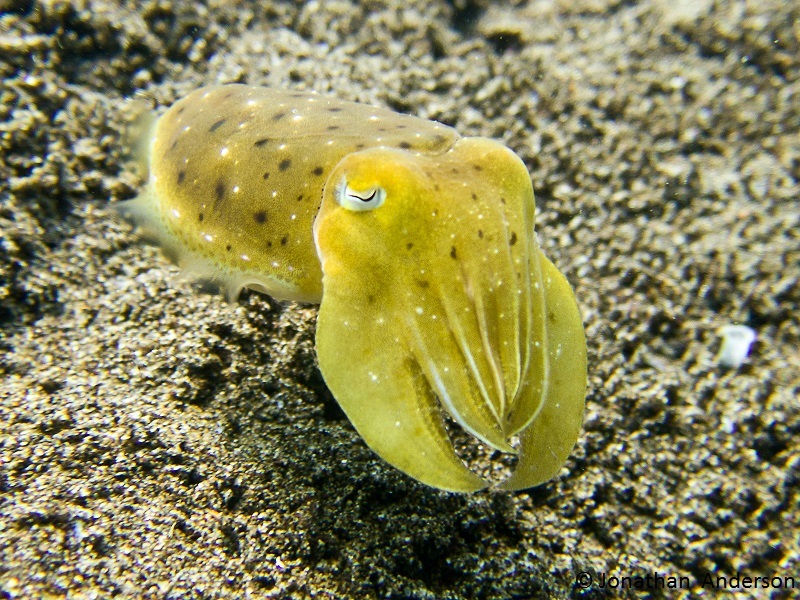 Broadclub Cuttlefish are named for their two large, flattened arms that frame the other six. The two pictures here were the same critter taken only moments apart, showing how rapidly Cuttlefish can change their moods. We all know people like that. 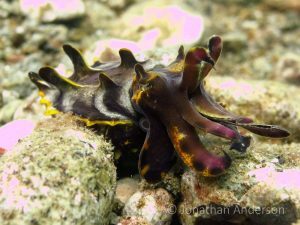 A favourite of ours, and a star performer here in Dauin, the Flamboyant Cuttlefish lives up to its reputation. With the largest number of distinct designs and textures to choose from of all the Cuttlefish (up to 75 distinct patterns, it’s thought that a particular display called “Passing Cloud” with alternate waves of darker and lighter bands, used by Flambos when hunting, may ‘hypnotise’ their prey into staying to watch the floor show, little knowing they are about to be the main course. Click here to see a Flambo performing the Passing Cloud dance! Another little-known fact is that the muscles of the Flamboyant Cuttlefish contain an unidentified, highly toxic compound similar to that found in its cephalopod relative, the Blue-Ringed Octopus. So sit back and enjoy the show, but don’t wait around for the encore!